Feel what it’s like to take command of the controls and soar through the air with an experienced instructor. Select an aircraft above to view price. Designed for the budget-minded person who wants to try their shot at taking the controls, and is curious about what it's like to perhaps become a rated helicopter or airplane pilot someday. Designed for the budget-minded person who wants to try their shot at flying a helicopter. Designed for the budget-minded person who wants to try their shot at being a pilot. Designed for the thrill-seeker wanting to experience more than just the basics, the Intermediate Discovery Flight is more than just getting your feet wet. You will have the opportunity to experience the thrill of flying a helicopter or airplane for the first time. Designed for the thrill-seeker wanting to experience more than just the basics. Designed for those who want to experience the aircraft's full potential and have plenty of time to practice their new pilot skills. The Advanced Discovery Flight is just the right length of time to demonstrate nearly all of the maneuvers student pilots practice to become rated pilots. Designed for those who want to experience the aircraft's full potential and have plenty of time to practice their new pilot skills. CHOOSE AN AIRCRAFT R-22 - Up to 220 lbs. R-44 - Up to 300 lbs. R-66 - Up to 300 lbs. The full experience of what it is like to be a helicopter pilot is offered in the Ultimate Discovery Flight package. 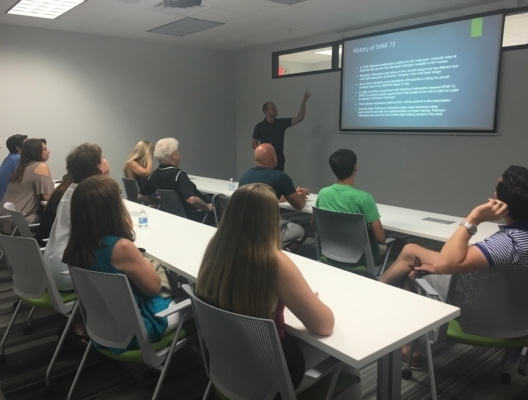 Starting with a 30 minute classroom session, you will be introduced to concepts of helicopter flight and learn more about the aircraft you will fly. Then, we introduce you to the basic maneuvers in our flight simulator to get you ready for 1 hour of flight time in the helicopter, all with an Epic Helicopters Flight Instructor. Included in this incredible package is a pilot logbook, where we will log your first hour in the aircraft. The full experience of what it is like to be a helicopter pilot is offered in the Ultimate Discovery Flight package. CHOOSE AN AIRCRAFT R-22 - Up To 220 lbs. R-44 - Up to 300 lbs. Designed for giving a new student pilot a kick start to their flight training without necessarily committing to the full training program. The flight and classroom time advances the student through our actual training curriculum. It also includes a pilot logbook and the primary textbook used in training. Training time counts toward the pilot certification requirements should the student decide to further pursue training after finishing the kit. This is the perfect gift for someone that has a serious interest in becoming a helicopter pilot or for someone with previous flight experience in airplanes. You can also buy this for yourself if you want to get a taste of the helicopter pilot certification training program without committing to the full course of instruction. The student will progress through our actual helicopter pilot training syllabus used to instruct students in our professional pilot program. At the end of the starter kit, the student will have completed flight lessons 1 through 5 and ground (classroom) lessons 1 through 5. They will have acquired some piloting skills and may even be able to hover (the hardest part of flying a helicopter)! They will also develop a familiarity with the aircraft they are flying. The starter kit can be purchased without previously purchasing a discovery flight. While not mandatory, we recommend the student use all of the lesson credits in the starter kit within an 8 week period from their first lesson so they can efficiently build upon previously acquired skills. 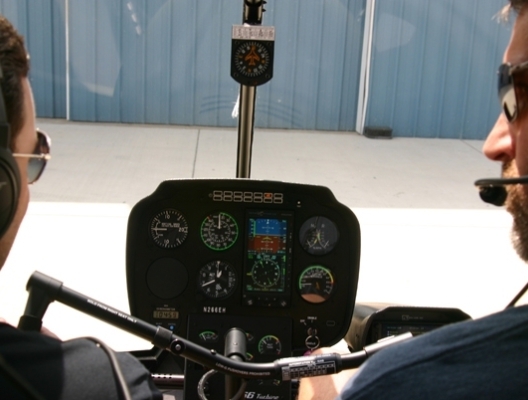 All flight and classroom time will count toward the requirements needed to become a helicopter pilot should the student decide to continue training past the starter kit. The student will experience all of the maneuvers in the other discovery flights offered, but in a much more immersive experience. The date you select on the next screen will be the first date of a series of approximately 5-6 visits to our Flight Training Academy to complete the entire Pilot Starter Kit. The remaining training dates will be determined after the first lesson. Discovery flights are conducted at our Flight Training Academy in Fort Worth, Texas. Great and awesome customer service by Steven and Mike. They went above and beyond...They made our experience an unforgettable one. I loved every bit. You cannot go wrong with them. They are the BEST. Daryl L.
Acceptable passenger loads change depending on how much fuel weight is carried and the weight of the pilot. Because this is different each flight, leave the complicated calculations to us. In general, you should know that discovery flights in the R22 helicopter are limited to 220 lbs. Discovery flights in the R44 and R66 helicopters are limited to 300 lbs. When you arrive for your flight, you may be weighed and the final loading calculations will be completed at that time. It is possible that passengers weighing less than but close to the restrictions above could result in an out of balance condition. In this case, a larger helicopter must be flown. Two options will be presented to you at this time. Because of the price difference, you would have the option to pay the difference and fly the same length of time, or shorten the flight and not pay any additional. We appreciate your understanding that we are responsible for your safety while on board. Where does my discovery flight take off from? All discovery flights depart from our Fort Worth Meacham Airport location, which is also the home to our Flight Training Center. Can Someone Ride Along On My Discovery Flight? Yes! For discovery flights booked in the R44 and R66 helicopters or Cessna 172 airplane, we allow one passenger to ride along with you. What is the Minimum Age for a Discovery Flight? We recommend 10 years of age to fully enjoy the experience. With two seats and a maximum take-off weight of 1,370 lbs, the R22 is the most popular training helicopter in the world. It is also used for many other applications such as aerial photography, aerial survey, pipeline patrol, livestock mustering and personal use. The helicopter is powered by a 4 cylinder 145 horse power Lycoming engine. The overwhelming majority of helicopter student pilots train in the R22 and training schools widely use the R22 more than any other type of helicopter because of it's dependability and lower operating costs. For students going through all training courses that will make them eligible for employment as a pilot, their first job will very likely involve flying Robinson helicopters. Because of this and the training requirements necessary to be qualified to fly the aircraft, which is unique to the R22, it is advisable to conduct most if not all of student training on the Robinson platforms to be as qualified as possible walking into your first helicopter flying job. * Allowable passenger weight depends on the length of the discovery flight and the instructor's weight. Please see our Frequently Asked Questions for more information. 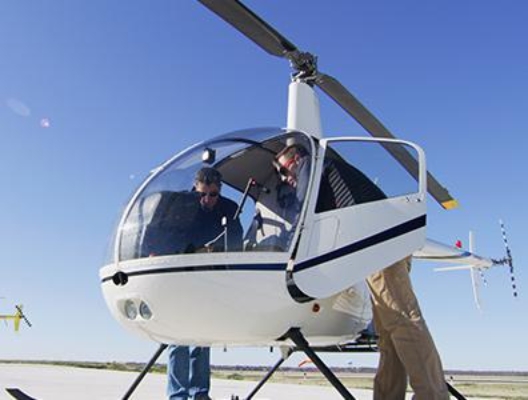 With four seats and a maximum take-off weight of between 2,200 - 2,500 lbs (depending on which model), the R44 is the most popular helicopter for training for instrument flight rules (IFR) and is also widely used for training under visual flight rules (VFR) too. The R44 is popular with private owners for its low acquisition cost and affordable operating costs compared to other manufacturers. The aircraft is piston-powered and has three model variants. The R44 Raven I has a max gross takeoff weight of 2,400 lbs and does not offer air condition. The R44 Raven II can carry 100 more lbs at 2,500 lbs max gross takeoff weight. The Raven II also offers air condition as an option. The newest addition to the R44 models is the R44 Cadet, which is designed as a next generation training aircraft. The R44 Cadet seats two passengers, can accommodate advanced avionics and has a lower max gross takeoff weight at 2,200 lbs. The Cadet was certified and made available in 2016. All models are piston powered with a six cylinder Lycoming engine. With 5 seats and a maximum take-off weight of 2,700 lbs, this turbine-powered helicopter is the most economical turbine powered civil helicopter used for turbine transition training and, for some future R66 owners, a platform for all of their training, if desired. Seating configuration is one pilot and one passenger in the front with 3 forward-facing passenger seats in the back. The R66 is powered by a Rolls-Royce RR300 turbine engine with 300 shaft horse power. The aircraft is widely used in helicopter tour and charter operations as well as private ownership. Of all the Robinson helicopter models, the R66 is the largest and offers a spacious baggage compartment that can accommodate up to 300 lbs of cargo. The aircraft is very capable, reliable and has been in production since 2010. With 4 seats and a maximum take-off weight of 2,450 lbs, this piston engine airplane is one of the most economical and safe training aircraft in the world. Seating configuration is one pilot and one passenger in the front with 2 forward-facing passenger seats in the back. The Cessna is powered by a O360 piston engine with 160 shaft horse power. The aircraft is widely used in flight training as well as private ownership.